When aliens misinterpret video-feeds of classic arcade games as a declaration of war against them, they attack the Earth using games like PAC-MAN, Donkey Kong, Galaga, Centipede and Space Invaders as models for their various assaults. 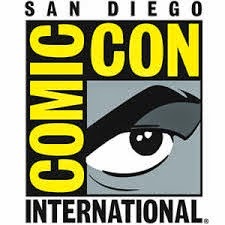 President Will Cooper (Kevin James) has to call on his childhood best friend, ’80s video game champion Sam Brenner (Adam Sandler) to lead a team of old-school arcaders (Peter Dinklage and Josh Gad) to defeat the aliens and save the planet. Based on the short film by Patrick Jean and screen story by Tim Herlihy with a screenplay by Tim Herlihy and Timothy Dowling, PIXELS is directed by Chris Columbus. CULVER CITY, Calif. (Sept. 9, 2015) – From Adam Sandler’s Happy Madison Productions and Director Chris Columbus (Harry Potter and the Sorcerer’s Stone) comes the visually spectacular action-adventure PIXELS, debuting on Digital HD Oct. 6, and on Two-Disc 3D Blu-ray™ Combo Pack, Blu-ray and DVD October 27 from Sony Pictures Home Entertainment. When aliens misinterpret video feeds of classic arcade games as a declaration of war, they attack the Earth in the form of the video games and it’s up to Adam Sandler (Grown Ups 2), Kevin James (Paul Blart Mall Cop 2), Michelle Monaghan (Source Code), Peter Dinklage (“Game of Thrones”) and Josh Gad (The Wedding Ringer) to save the world! 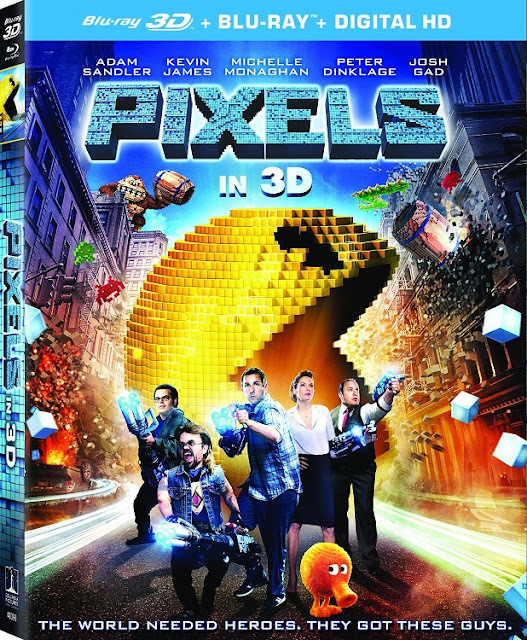 PIXELS also features Sean Bean (“Game of Thrones”), Jane Krakowski (“30 Rock”) and Ashley Benson (“Pretty Little Liars”). Fans can explore the various levels of PIXELS with the extensive Blu-ray and DVD bonus materials, including the music video “Game On” by Waka Flocka Flame ft. Good Charlotte and two featurettes that take a look at the beloved games featured in the film. In “Q*Bert,” the adorable digital bit hopper comes to life, while “Dojo Quest” gives viewers a look at the new classic arcade game that gave life to the unstoppable Lady Lisa (Ashley Benson).PIXELS on Blu-ray includes even more exclusive, behind-the-scenes fun, with six additional featurettes, including looks at all the classic arcade game characters featured in the film and “Creator of the Machine,” which shows PAC-MAN™ creator Toru Iwatani on-set, talking about his experience and his take on PIXELS. Viewers can also game play alongside the Arcaders using the “Pixels Blaster App,” a second-screen experience that lets viewers battle their favorite arcade legends and test their gaming knowledge while they watch the film. The app syncs with the audio on the Blu-ray disc and the Digital version of the film. The PIXELS Blu-ray is also exclusively presented with new Dolby Atmos audio, remixed specifically for the home theater environment, which delivers captivating sound that places and moves audio anywhere in the room, including overhead. The film is produced by Adam Sandler, Chris Columbus, Mark Radcliffe and Allen Covert; with Barry Bernardi, Michael Barnathan, Jack Giarraputo, Steve Koren, Heather Parry, Patrick Jean, Benjamin Darras, Johnny Alves, Matias Boucard, Seth Gordon and Ben Waisbren serving as executive producers. “Q*Bert” - The adorable digital bit hopper comes to life in PIXELS! “Dojo Quest” - A look at the new classic arcade game that gave life to the unstoppable Lady Lisa. “The Creator of the Machine” – PAC-MAN creator Toru Iwatani was on-set and had a cameo, we hear from him about his experience and his take on PIXELS. “The Space Invader” - The winner of an arcade contest had a walk on role in the film. “PAC-MAN” - A detailed look at the PAC-MAN action sequence. From Mini Coopers and stunts to visual effects, see how PAC-MAN chomps his way into real life. “Donkey Kong” - See the cast perform stunts on a giant reconstruction of the classic platform game and watch as Donkey Kong goes from bits to BIG. “Centipede” - The giant insect attack was the creation of visual and special effect planning as well as the patience of countless performers. “Galaga” - This 80’s arcade favorite leads the alien invasion, take an inside look at the attack on Guam.